I'll post those pics later, but I also stumbled upon several boxes of black granite tile. I was planning on using them in the bathroom once that got remodeled ten years from now. But granite is very slippery when wet, so I was a little aprehensive about that. Which got me thinking...is it really a good idea to use granite for flooring anywhere? Probably not. 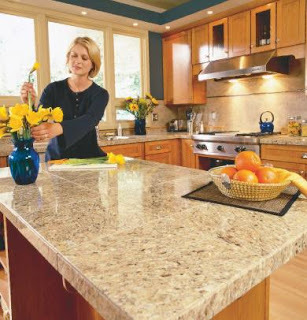 So, I looked online and found a bunch of links for granite tile kitchen counters. The seems aren't overly noticeable, and it'll be a million times cheaper than granite slab. I'm still on the fence but feel free to leave me comments and give me your two cents. Hey, I know this post was from a while ago, but just found it through IkeaFans...just thought I'd drop a note saying we remodeled our last home with granite tiles (12 x 12?) with very narrow seems, matching grout...and loved them. Really functioned well. Just be careful to seal them according to instructions! We used WAY too much and had to remove...and start over. Geesh.